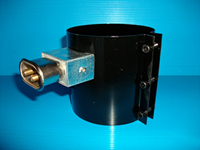 Flexible mica band heaters are designed to open up and flex over the machine barrel without having to remove other heaters or fittings. Construction: Nickle Chromium wire or ribbon is wound onto a mica former, encapsulated within a zincanneal sheath. A stainless steel clamp band complete with swivel toggles is provided for clamping.